Progressives consider Norway to be the freest country in the world and a model for the rest of the world (a.k.a. The Myth Of Norway). Given that progressives are notoriously politically correct and addicted to virtue-signaling, one might think they would conclude that what Google did to James Damore proves that it is America who has been the vanguard of politically correct fascism for decades, but consider that in Norway, one can go to jail for three years for incorrect speech. In spite of high rates of alcoholism and suicide, and an increasing number of rapes (a reality suppressed by the three companies that own just about all of the print media in Norway), another reason progressives see Norway as the vanguard of progressivism is because when Norway discovered a huge oil field, it created jobs by building some very expensive “unsinkable” naval vessels and by creating jobs for women on those vessels. In fact, it didn’t just make those jobs available to women, it guaranteed that women would be on those vessels by enacting forced conscription. Being the vanguard of progressivism, it should be no surprise that the media in Norway celebrated the conscription of women into the Norwegian navy. 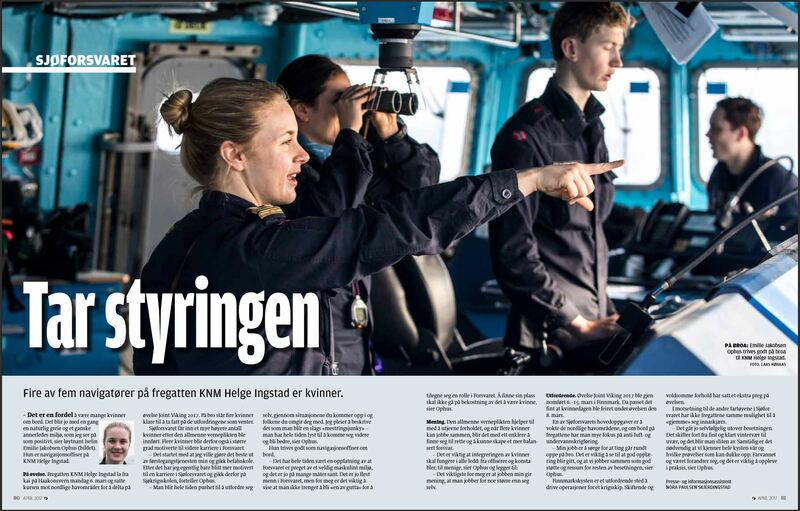 For example, in April of 2017, the Norwegian magazine Forsvarets Forum included an article celebrating the mostly female crew of the frigate KNM Helge Ingstad. The article’s subtitle was “Fire av fem navigatører på fregatten KNM Helge Ingstad er kvinner”, which Google Translate converts to: “Four Out Of Five Navigators On The Frigate KNM Helge Ingstad Are Women”. The title is “Tar styringen”, which translates to, “Taking Control”. It explains how the crew will be even better than an all male crew. The initial damage in this event occurred when the frigate collided with an oil tanker, so some might think that the oil tanker was at fault, but not only was the frigate far more maneuverable than the much larger and fully loaded oil tanker, the frigate ignored repeated warnings from both the tanker and the Sea Command. Also, the frigate had failed to turn on its transponder. The frigate even turned the opposite direction all ships are supposed to turn in such a scenario. After the collision, the crew decided the ship may be at risk of sinking, but instead of closing the bulkheads to prevent it from sinking (which had usually worked on more primitive ships, such as the USS Liberty), they decided to prevent the risk of sinking by running it aground (onto the rocks). The fact that it happened in this particular area is incomprehensible. Here we have a traffic centre packed with radar monitoring equipment reading transponder signals from all the vessels in the area. The frigate had state-of-the-art radar equipment and infrared optical systems. How is it possible that the vessels didn’t see each other? If this is how the Navy trains its naval officers, it’s shocking. They do not show any discipline or understanding of the roadmap rules, nor how to communicate or navigate at sea. In the audio log, you hear the use of voice that does not seem as if the crew in the frigate is aware of the situation they are in. They are not aware that they are heading for danger. The failure to close the bulkheads is even more serious than it sounds because if the crew of the USS Liberty (a refitted WWII vessel) had failed to close the bulkheads after being torpedoed by Israel in 1967, it would have sank, and Cairo would have been nuked by the US because the US and Israel were conspiring to sink the USS liberty, kill everyone on board, and frame Egypt (a B-52 with a nuke was already on its way to Cairo), but the competence and heroism of the crew that day thwarted the attempted false flag, which thus postponed the US war on Muslim countries for decades and saved Cairo from being nuked. Also, consider that in pop culture (e.g. TV), women are not accountable for their actions … and that is how it worked in real life too in this case because these women were immediately given another ship! If they were men, they would have been court martialed, and if the men who are being displaced to make room for them on their new ship complain about being displaced, or if they express concern about the proven incompetence of the women displacing them, it is they who would be court martialed. Anyone who joked that “Tar styringen” translated to “Warrior Princess” … had no idea how right they were, but don’t blame the individuals for the system. They are being played just like everyone else. One might think that obvious economic considerations alone would have forced rational decisions, but according to progressive economics, damaged property is good for the economy because the need to repair or replace it creates jobs (a.k.a. the broken window fallacy). What do you do when your languishing socialist nation gets a new lease on life from the discovery of a huge oil field? Well, of course you blow it on expensive unsinkable ships in order to create cool politically correct jobs. The incompetent affirmative action hires sank the unsinkable ship? Even better! Now you get to build another one! More jobs! And you salvage their self esteem by immediately putting them in charge of another ship, and if they sink that one too … more jobs! When the oil dries up, the players will have all of Norway’s money, and Norway will begin borrowing money from the players in order to maintain the fantasy longer. Norway has now 2x “Pikene på broen”; A painting by Edward Munch, and Female Navigators on “Helge Ingstad”, both world-renown by now I guess.